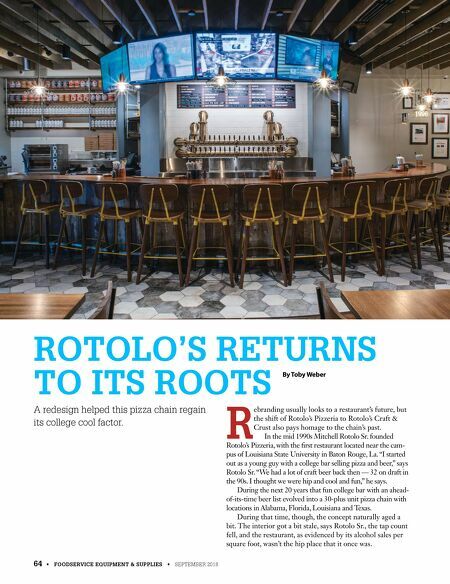 64 • FOODSERVICE EQUIPMENT & SUPPLIES • SEPTEMBER 2018 ROTOLO'S RETURNS TO ITS ROOTS A redesign helped this pizza chain regain its college cool factor. By Toby Weber R ebranding usually looks to a restaurant's future, but the shift of Rotolo's Pizzeria to Rotolo's Craft & Crust also pays homage to the chain's past. In the mid 1990s Mitchell Rotolo Sr. founded Rotolo's Pizzeria, with the first restaurant located near the cam- pus of Louisiana State University in Baton Rouge, La. "I started out as a young guy with a college bar selling pizza and beer," says Rotolo Sr. "We had a lot of craft beer back then — 32 on draft in the 90s. I thought we were hip and cool and fun," he says. During the next 20 years that fun college bar with an ahead- of-its-time beer list evolved into a 30-plus unit pizza chain with locations in Alabama, Florida, Louisiana and Texas. During that time, though, the concept naturally aged a bit. 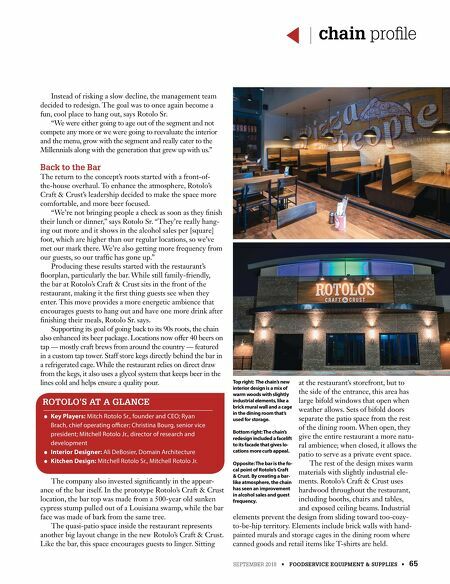 The interior got a bit stale, says Rotolo Sr., the tap count fell, and the restaurant, as evidenced by its alcohol sales per square foot, wasn't the hip place that it once was.